What is the Bionic Runner? It is a non-impact cross-trainer most have never heard of but those that train with it are setting Masters aged world records when many older athletes either taper down their run mileage or stop running all together. 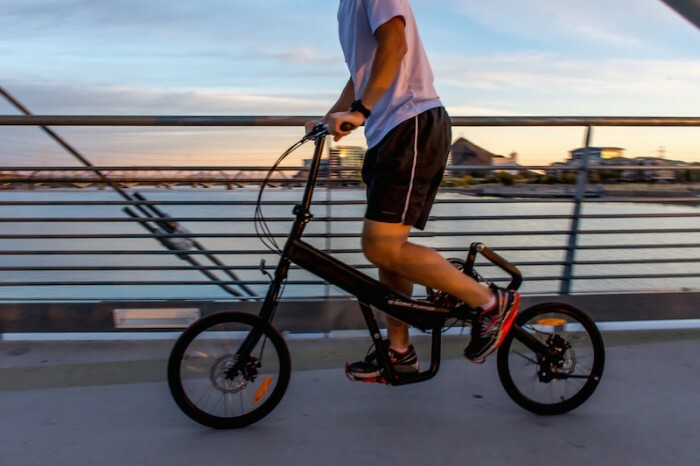 The Sports Techie community blog chatted from Atlanta to Brisbane, Queensland, Australia, via Skype with Steve Cranitch, founder of Run4, the sports tech company that invented the game-changing outdoor bike. The Bionic Runner is different than an elliptical trainer because it closely mimics the natural gait and timing of running. After a successful early adopter Kickstarter crowdfunding campaign of $290,000 to launch the product, users can now be found in 34 countries around the world. I found Crantich to be a kindred spirit in that we are about the same age, we both have technology backgrounds, and we each have passion for what we do. The Bionic Runner is rapidly changing the training routines of serious runners for events as well as affecting run recovery and preventing injury. Since releasing in 2015, the Bionic Runner has inspired a global community of passionate, world record-breaking runners, the injured and specifically those with knee problems because of the 60/40 phase time, leap and running feeling, and gait economy. How do you train to run faster? The Bionic Trainer By Run4. This innovative sport tech bicycle will not turn you into the Bionic Man, Steve Austin, even though the TV show fueled the invention. Crantich played rugby with mates in his youth. He found nearly all of them gave up running and are now into cycling. His vision was to create a bike that allowed his friends to pro-actively prevent injury, or continue training through injury, should it occur. He invented the Bionic Runner – the world’s first non-impact, running specific fitness trainer. Designed to help you turn up on race day fast, fit and injury free. The Bionic Runner enabled him to fix a massive unsolved problem of how to create a cycle that allows those searching for a way to perform and exercise to the closest activity to actual running without the threat posed by high-impact running. By running more miles, the fitter you become but there is a greater chance of sustaining an injury. By increases strength, conditioning and endurance, fewer injuries occur. Stride length and frequency makes you run faster, stride efficiency is the key to improved running performance. The ground reaction force is what is missing from bikes, ellipticals and other cross-fit trainers. The unique patent-pending Run4 60% swing and 40% stance phase timing, guides the foot along the path of a mid-foot running gait. Compared to elliptical cross-trainer, bionic runner stance phase culminates in major pedal reaction force, toe off driving a runners hips into the air. The stance phase of a run and Bionic Runner workout are virtually the same impact point and drive. As a result, riders can reach their Vo2 max in half the time of ellipticals using the Bionic Runner. The non-impact closed kinetic chain of the Bionic Runner chain mimics foot strikes, and eliminates the risk of strains from training over extensions or impact fatigue, the two most common causes of joint, tendon and muscle-related strain injuries. A major key is the conversion ratio of the Bionic Runner versus runner using a time base. Their online forum consensus is the Bionic Runner equals to running mechanics and output. Users can perform advanced techniques such as resistance, over speed and threshold training. What is the Bionic Runner? It is a non-impact cross-trainer. Four years ago, Steve had a vision of an injury-free running community. What began as a six months process morphed into nearly six years of development and six bike prototypes until the finished product was ready to sell. Each bike is hand-made and factory made in Shenzhen, China, where Steve says,”The sun rarely shines as it does in Australia.” The aluminum frames are alloy 6061 and meet industry standards by using a T6 industry heat process. It has welded, painted and has forged parts. Assembly and QA are done in Australia by his team and then shipped off around the globe. The Bionic runner internal gear hubs have eight speeds made by Sturmey-Archer, a UK pioneer for the past 100 years. It comes equipped with front and rear disc brakes that will not wear out the rims. The proof-of-concept was to provide the public with a relatively maintenance free bike with high quality components. The cable stretches out when new after a few rides and can be easily tweaked with a 10-20 second adjustment, just grease the chain once in a while and it is good to go. 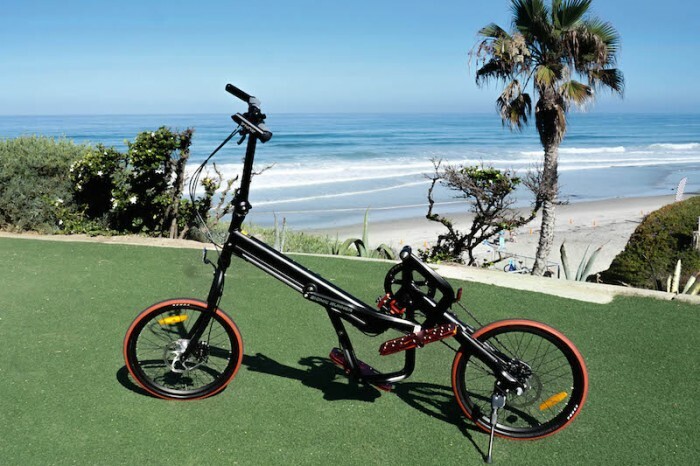 It is designed with a running gate and mid-foot strike but does offer a full foot or pedal strike. Bionic Runner has 120 kilo rate safety factor of three times or 265 pounds for people with larger body types and weights. The bike will integrate with existing GPS and heart rate monitors of whatever type is used. It can also link to the Strava app. Their R&D team consists of an Australian engineer, and three others in Finland, the U.S. and Shenzhen. The development team uses Skype for video transmissions, WayChat China for messaging and an application called Teamwork to further communicate designs, modifications and new concepts. 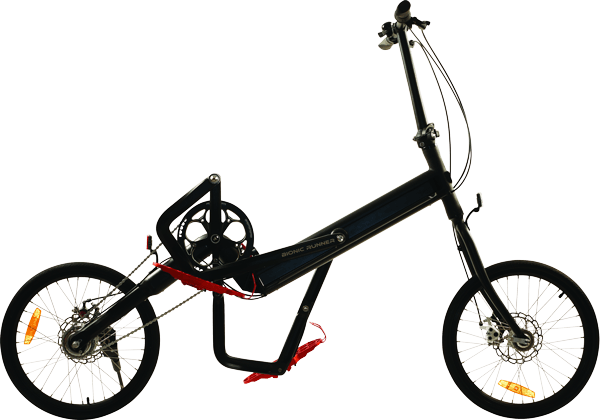 The bike and steering mechanism folds down and fits into a car. It functions indoors on rollers in case you are at a desk or work. Instructional videos on YouTube are clear if you need further direction. Pricing on the website has three different packages. Full retail is $1,490. Purchasers can save $200 by conducting two product reviews. The biggest savings of $600 off requires a written review, a web-cam review, and 12 test rides referred to you of folks interested in the Bionic Runner. All sales require an additional $99 shipping fee. The Bionic Runner has been credited for a number of recent running achievements, including 63-year-old Australian, John Shaw’s single age world record in the Gold Coast Airport Marathon in July. Shaw has been using the bionic runner in his training for the last year and this is the second world record he has set in 2016 alone. With a recurring calf injury, the 63-year-old had taken up the very difficult challenge of running a half marathon with just five week’s training. “The Bionic Runner was my saviour during this dark period,” he recalls. “I put in 1.5-2.5 hour runs on the Bionic Runner every other day to maintain my aerobic fitness, but when race day came, I didn’t set a goal time, I just decided to try my best.” Unbelievably, John ran 1.21.16 on an undulating course, with a 70 second PB. Fast forward just two weeks, and John joined three fellow runners on the tarmac to attempt to beat a four-by-1500m relay record that had stood for 20 years. “On a hot summer’s morning we broke not one, but three records: the world record by 27 seconds; the Australian by 1:07 and the state by 3:01,” John recalls. “The regular hard workouts during my injury downtime made me a strong runner,” he adds. “With a stronger core, hips, glutes, quads and hamstrings I could push myself harder than I had ever done before.” And John hasn’t stopped there, going on to set a single-age world record for his time in the recent Gold Coast Marathon in July 2016. Brandon Lee-Hall lives in the UK and plans to run 813 miles (or 31 back-to-back marathons), in under nine days, two hours and 26 minutes, equaling to more than 90 miles every day. Before race day, he faces the very real prospect of running into injury. Mick Thwaites bought one from his hospital bed and went on to set an Australian record 6 months later running 413 km in 48 hours. Dr. Tom Anthony, PHD from Harvard is retired, super fit and another happy Bionic Runner owner. Women are about 40 percent of the user base and have contributed many stories about their satisfaction with the bike. The frame is below your knees for most male and female bodies. Steve emphasized it is not a kids bike or made for females under 5’2” because of narrow hips, it is not suited for these ladies because the pedals can go out. The youngest users are 16, it is not recommended for under 15-years of age. Cranitch mentioned his company is a member of Australian Sports Technologies Network (ASTN). I asked him if Craig Hill’s vision to have the land downunder become the Silicon Valley of sports technology was doable. He answered that unlike America and especially Silicon Valley where angel investors, early stage venture capital or startup incubators give money to inventions, companies and founders, that model is not really existent in Australia making it hard to launch and sustain a business. The Bionic Runner is self-funded with no VC capital. Several prototypes were developed before the Kickstarter campaign. When asked if he was going to be an angel investor for the Aussie sports tech community he laughed and said it was too much work. Steve is a jack-of-all-trades entrepreneur for his company because of his corporate, business and sales background. This is his fifth startup in 16 years. He started a Skype like service for postal mail with a domain name of Bing that was sold to Microsoft. He said it is the awesome user stories that are grateful for the Bionic Runner, many former runners that often underwent total hip replacements that drive him. I personally get that because I too often reflect on the smart, motivated and innovative people behind the stories I am blogging about like Steve’s. The company has no exit strategy because the engaging founder says, “It’s a great business, why would you exit.” Run4 currently has six employees before the Kickstarter crowdfunding campaign it was two. The top selling markets are the US, Australia and the UK. Buyers can add any type of accessories without the risk of voiding the warranty. Anything on the Bionic Rubber can be changed including the handlebars, grips and pedals, brakes and components. 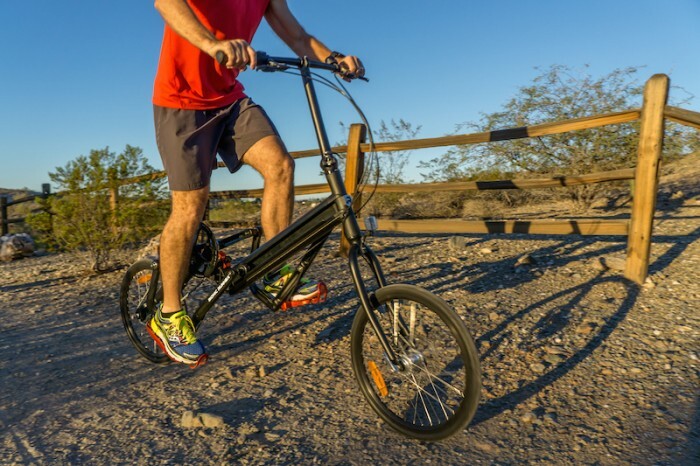 He was frank in that the Bionic Runner does not climb hills as well as an eBike or provide a better workout than a road bike but compared to any elliptical trainer or competitor such as the Eliptic-Go, it is the best non-impact cross-trainer on the market. Sports science journals have written positive reviews about the Bionic Runner. Australian Journal of Strength and Conditioning shows that, whether using the Bionic Runner for interval, Fartlek, tempo or hill sessions, the runner offers the same intensity as conventional running – without the risk of injury from over extension or impact fatigue. Bionic Runner By Run4 Saves Knees, Tendons And Joints While Mimicking Runners Gait – SportsTechie blog. Sports Techie, I immediately thought about my Dad as a perfect candidate for the Bionic Runner. Danny Roble played a ton of hoops growing up near Detroit on the blacktops as a kid and took on running as an adult in Seattle completing marathons. My parents live in Bend, OR and Pops still loves cycling, trail walking and Nordic skiing because his knees do not allow him to run anymore, his next step is knee replacement surgeries. The stubborn Polish man turned 73 this year and feels pain in his knees walking down MT Bachelor where he works. I can’t wait until he finds out about the Bionic Runner because it is tailor made for him because he especially loved to run outdoors. As for me, I turned 50 this year. I played about every sport growing up and can still play basketball, lacrosse and baseball or softball, soccer and flag football with the yutes when I want to. I am a former Certified Personal Trainer, am a former bike courier, I sold LifeFitness exercise equipment, and still love to MT Bike. Staying in cardio-vascular shape is a challenge living inside the big city making the Bionic Runner a nice workout option. I caught the attention of Cranitch with my idea of providing competitions between their international group members, something he had not really thought about but is willing to investigate for the future. Additional Run4 products are coming out soon with more models that are lighter and faster. For now, the Bionic Runner is the world’s only high intensity, non-impact, running-specific trainer. It’s the running trainer helping masters go the distance.